Since Ryan and I are currently living in temporary housing, I’m hesitant to join a gym. I’m not sure exactly where we’ll end up and I don’t want to get roped into a contract. Plus, I’ve been loving Pure Barre (I signed up for the new client package) and the free little gym we have at our disposal at our apartment complex isn’t too shabby! It has a few cardio machines and free weights, so outside of Pure Barre, my workouts have been rather simple and taken place at our little gym (or outside)! Here’s a super simple workout that can easily be completed with free weights and a treadmill and targets both the upper and lower body. It’s a good one for days when you’re feeling indecisive at the gym and want a workout that keeps things moving! No Joke Walking Workout: A challenging 20-minute incline walking workout. 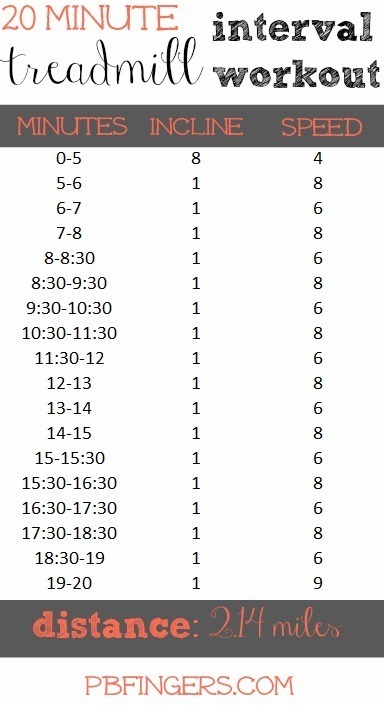 15 or 30 Minute Treadmill Workout: You choose the length of this incline walking workout. 20 Minute Treadmill Blast: This workout alternates running with super-fast walking. 20 Minute Interval Workout: Get your heart rate up fast with this treadmill workout. 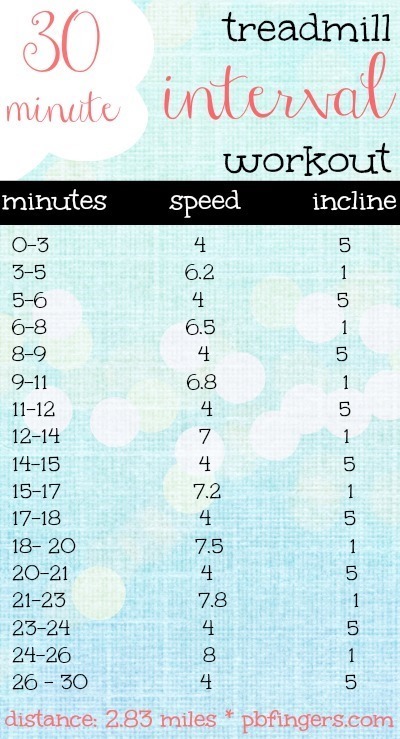 25 Minute Interval Incline Workout: Changing speeds and inclines hold your interest and fight treadmill boredom. 30 Minute Feelin’ Lady Treadmill Workout: Dubbed the “Feelin’ Lazy” workout because it eases into the running portion of the workout. 30 Minute Interval Workout: This workout begins with run/walk intervals, but kicks things up a notch once you’re warmed up. 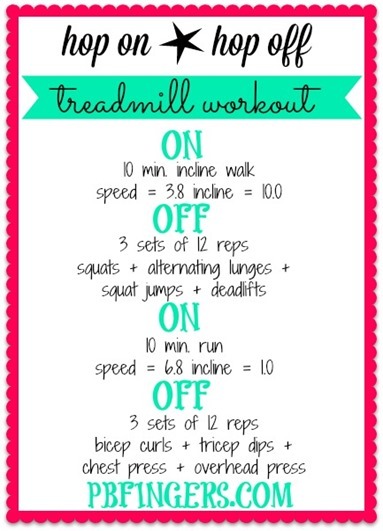 30 Minute Treadmill Workout: With speeds reaching 10.0 on the treadmill, this is a tough one. 30 Minute Intense Incline Treadmill Workout: One of the hardest treadmill workouts I’ve ever posted! 40 Minute Lazy Girl Workout: The pace of this workout picks up gradually, perfect for days when you’re not really in the mood to workout. 55 Minute Treadmill Incline Walk/Run Workout: This workout only includes 15 total minutes of running but the running is spread out throughout the workout, so if you’re not a big fan of running on the treadmill, this workout doesn’t include a ton of it! If you don’t have a gym membership, where do you go (if anywhere) to work out? Before I had a gym membership, I would use the gym at my apartment. It has a few cardio machines and free weights but I wish there was more. I would also do youtube workout videos at home and think they’re pretty fun! After skipping around to gyms over the past two years, I finally decided to make an investment in Les Mills Body Pump at home set. It comes with weights, 4 levels of Pump DVDs, an ab DVD, and a quick Flow workout. I aim to do 2-3 Pump workouts per week, and the other days, I alternate between walking my crazy weimeraner, and running 5-10k. I quit the gym, and am saving myself a fortune per month, and I just love the flexibility! I’m on a budget, so I have gotten rid of my gym membership. Fortunately, running and walking outside is free! I have some weights and an exercise ball that I use a ton. Unfortunately, our winters are terrible here, so outdoor exercise isn’t always an option. In the winter, I really rely on exercise videos, Youtube and the occasional snowshoeing adventure! I’ve heard awesome things about T25! Have you found any good workouts on Prime? I found the Billy Blanks Jr Dance Cardio workout and laughed a lot, but it got the blood pumping :). Jillian Michael’s “Yoga Meltdown” (or something like that, haha) was good for a low key workout, although it’s definitely more yoga-inspired than actual yoga. Her “Banish Fat, Boost Metabolism” one is a good 45 minute cardio workout, but it’s very high impact, so with my bad knees/ankles I can’t do it very often. I just can’t stand her coaching style or her fitness philosophy, so it makes it hard to enjoy the workouts even though they’re good! Great idea to break up the cardio. I use my apartment gym it has free weights and a treadmill so it gets the job done for now. I love fitness classes and enjoy mixing it up with those when I get the chance. Great workout! I’ve been looking into doing more things on the treadmill but get so bored just running for miles straight. When the gyms not open I look out for drop in classes at other places or mix it up with a quick run and an NTC app workout at home! Never had a gym member ship. I have set up sort of a small home gym in my basement and I always run outside! Trails, group runs, around the city runs. All fun! I’m all for treadmill workouts that keep me engaged and aren’t monotonous. Lately, I hardly ever use my gym membership and am thinking about cancelling it all together. I’m about to start a PiYo video challenge and Youtube just has so many great videos now! Wow what a selection! Every time I try to run on the treadmill I hate it because of the monotony but these workouts break it up really nicely. I may have to try these soon, maybe I could translate them to 10 minutes running outside, some core work, 10 more minutes running, etc. It would be like a combination between interval training and HIIT! I am a member of the YMCA in Charlotte. Its a bit pricey but no contract. Plus they have tons of free classes, pools, etc that I enjoy, and are clean and the staff is well trained. My go to is either go on a run outside or doing a body weight workout at home. The only thing I’ve got at my house are 5 and 10 lb dumbbells which actually are perfect for me to do a TON of exercises! The only thing I miss about a gym membership are class options. Some days I wake up wanting to just mix it up or be more social for my workout and I crave a group workout then! I workout at home. I quit the gym to save some money. Pinterest has been amazing and I’ve found so many great workouts! I also love to do workout videos I find on youtube or fitsugar. I also have a treadmill to use when I’m lazy and don’t feel like running outside. I found a purre barre close to my work and may have to do it a month or 2 before my wedding to really get in shape! We use our apartment gym too, and if I get bored I can take a yoga class at the studio down the street. I also found a dance company that offers classes open to the public, so I can get my old skool hip hop on! With a little one taking 2 hrs. going to the gym has become a thing of the past. Ever since you shared the youtube channels your readers recommend I’ve been loving the quick workouts on jessicasmithtv and add in others via fitnessista’s youtube channel also. So great! Thanks! Awesome!! So glad you like them! Those look like fun! I need to get on the treadmill again! While I have a gym membership, I don’t have time to go in the mornings so if I need to do an early workout, I like to run, or do a NTC app workout and just skip the equipment! You should do more of this style workout! I work out at home a majority of the time. I keep things interesting by running some days (various routes- road and trail), doing NTC other days, doing an online Yogaglo video, or Ballet Beautiful (thanks for that!! Kills me every time!). I also go to my local aquatic center and swim laps every so often. Just recently I discovered my work will provide money monthly for a gym membership and I’m thinking I’ll use that towards 2 different group fitness classes. I have a few pieces of equipment at home and while I would like to have a wider range of weights, I just can’t justify a gym membership. When I don’t have access to a gym I love to get outdoor workouts in at the track or a park! Hi Julie!! Are you waiting until you join a gym before going back to Body Pump? Thanks for the workout lists! My free workouts: There’s a (really nice, but smaller) gym at my office with really high end machines. But it’s hard to get down there, compete for a machine when it’s busy, and then shower and get back to work. But I will use that, because it’s free to me. But it’s pretty much a cardio gym, no free weights, and one big weight machine. I also loooooove go to on long, long, long walks. And I have a (very nice) recumbent bike at home. However, because most of the above is dependent on either other people or the weather, I’ve been heavily thinking of rejoining a gym, and I’ve narrowed it down to joining my local YMCA. I can go to any one of 21 locations in my city, and they have boatloads of classes! All day long, including at 8:00 p.m.! I was re-inspired to rejoin a gym when I saw a great ab workout in the pool, and I had forgotten all about how great the pool is for conditioning your body. I used to do (intense) water aerobics a long time ago and I loved it and miss it. It’s more expensive than other gyms (in my area), but the customer service and amenities can’t be beat, and it’s non-profit and helps the community. I’ve toured, had week passes, and re-toured my local Xperience fitness, and even though the price was great, the machines always need updating, it’s not very clean, and it’s super, duper, hard to cancel your membership (yelp has many complaints). I’m not sure if this is just a problem at my location, or with the franchise overall. The complaints seem to be from all over. Nobody complains about the trainers, but they complain about the billing department. I’ve also toured and tried out Anytime Fitness and Snap Fitness, but I’m not super thrilled about the idea of going somewhere that isn’t staffed all the time. And again, no classes, no pool, no locker rooms. I also used to be a member of Lifetime Fitness when it was new in my area, and they cost almost as much as the Y but with less amenities and a lot of pay-for-a-class-on-top-of-your-membership fees. I love going outside to workout when I can! The past 4 years I never had to worrying about getting a gym membership because of the gym at my school, but I no longer have that luxury! I currently use the small gym at my apartment, but hope to get a gym membership later this year when our budget isn’t so tight! These look great! I really want to try the 20 minute interval workout. Before Pure Barre came along – we were members of the YMCA. They offer a Metro Membership that lets you go to all of the YMCAs in Charlotte, Lake Norman and Mooresville. If you haven’t checked out the Lake Norman Y (it is between Cornelius and Davidson off 115) – you should go ! It is one of the few YMCAs that has waterfront property. They have a great triathalon training program there and offer practice swims in the lake. They also have some really good Group Exercise Classes. I am definitely partial to Pure Barre – but the YMCA is definitely worth checking out… and with a Metro Membership, it would not matter where you ended up in the Charlotte area – there would be a local Y. We setup a mini gym in our basement and I have been doing outside body weight workouts. I also use Groupon to find deals to try new exercise studios. It is a good way to get out of your comfort zone and try new things! So far, not having a gym membership has been fun! I recently cancelled my CrossFit membership since I cannot make the class times (and to save some $$$!) and have been doing a lot of intervals on the treadmill involving getting off and in like this one. I love these since I don’t get bored! The tone it up girls have a few good ones, would love to see some more here as I love all of your other work outs! I have a treadmill and some dumbbells at home and can get in a great workout! I love having the option to workout at home when I don’t have time to hit the gym or need to squeeze in a workout while the baby naps! Thanks for sharing this! One of my favorite treadmill work outs is very similar to this. Breaks up the workout.